This one-handed, wag-worthy washer makes bath time less stressful. Noisy hoses, scary spraying, and fumbling humans. Let's face it: bath time can be ruff! Make it less stressful for both pets and their owners with this wag-worthy washer. Aquapaw keeps the water focused on Fido's coat and your hands free for a faster, gentler bath with less mess and wasted water. The nubby washer pad straps securely to one hand, leaving the other free to control the canine chaos. Best of all, you control the flow of water simply by opening and closing your hand. As gentle as it is efficient, Aquapaw works like petting your dog—clean! Both garden hose and shower adapters are included for indoor or outdoor use. Fits North American hose connections. Designed by Daniel Lentz. Made in China. Read more about Daniel and the wonders of the Aquapaw on our blog. The Aquapaw Bathing Tool was designed by Daniel Lentz. He grew up around dogs and always thought that pet bathing was much harder than it had to be. While studying industrial design in college, he had that idea that the process could be made much easier if there were a tool that strapped to the palm and dispensed water in a very controlled manner. On and off over the last ten years while designing products for other prestigious brands, he developed the concept at night and on the weekends by designing, building, and refining prototypes. In 2016, he knew he had a viable product. 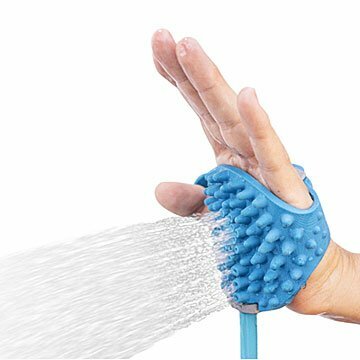 The Aquapaw Bathing Tool is based around an entirely new bathing technique that combines your water sprayer and scrubber into an intuitive bathing glove. It's unique and patent pending design eliminates the need to ever reach to adjust the flow of water and it allows you to bathe your pet the same way you would pet them. Fits North American hose connections. This has improved bath time by a MILLION! This has made bathing my dog so much less stressful. It is quiet and I think almost calming, like maybe it feels like a massage?! I can also tell she gets cleaner, probably because the water actually gets through her long hair down to her skin with this. Just love it. Where was this product years ago!! Used to be when giving our dogs a bath using a hand held shower, I got more overspray on me than directly on the dog. This product gives me 100% control over direction of water and stopping the water to lather up, is immediate start and stop with one quick click. Highly recommend this as it makes giving them a bath a joyful experience instead of stress. I used the product to rinse my dogs off. It is great for that as you control the water on/off. There is less frustration with the dogs and myself. I recommend it greatly but my hands are small and if I connect it to my hand as instructed, my fingers cannot reach the on/off switch. I can see that it would be good to use on washing others hair also. Water does not go everywhere and you don't get wet using it. Allows me to use both hands. Bought one for all the dog lovers in my life. They all loved it! I even bought myself one, too! This product was used for the first time the day after we got it. It was AMAZING. It made giving the dogs a bath so much easier and they didn't seem to be as scared of it since it's like petting them while they are getting the water on them. it still doesn't help with them not liking the water but it's still not as scary! Not just for the dog! Works very well. I only use indoors as I use the hose outside and that is basically the same thing. Doesn't have a whole lot of pressure so if your dog has two layers/very thick hair - may not be be the best uses unless you soak. My dogs (pitbull & beagle) both have short hair and it works great for them - highly recommend for their uses. You do have to install onto your shower head - FYI. Comes with plumbers tape and attachment needed to install. Such a great product. My mom loves it! Would buy again. Use in my bath tub since I live in an apartment but would work just as well outside!